Animal Crossing: New Leaf is one of the most anticipated 3DS titles of 2013 and we're just about two months away from seeing it arrive. With the game doing sensationally well in Japan, there's no doubt that North American and European 3DS users are looking forward to its release this June. With the game being so close to launching, owners of the handheld can search for the game on the eShop and are greeted by a reasonable $34.99 price tag when they do. Normally, first party titles are priced at $39.99, so it's nice to see a small discount, even if it is $5. A little goes a long way. Earlier this week, Nintendo fed our greeedy little selves with a new trailer for the upcoming simulation title. What are your thoughts on the price of Animal Crossing: New Leaf? Do you think future first party titles will stay within this price range? Let us know in the comments section below. Actually, Amazon has had it listed as $34.99 for a long time (not that Amazon is always right). Can't wait though! I hope one of my neighbors is Filbert because I got him in both WW and CF and he was my favorite neighbor...until the day that I found he had moved from my town on CF. Sweet! Now if they would lower the EU eshop prices. They have it bad. Whatever the price, it's worth it for Animal Crossing! I already planned to go digital on AC anyway, but it's nice to know I won't have to pay a $5 premium to do so. 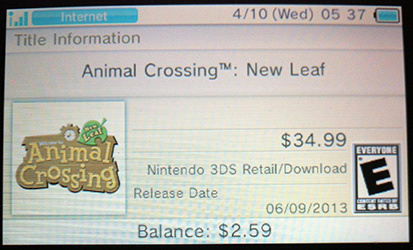 With that $5 saved, maybe I can use it to buy whatever Tom Nook is gonna sell in the game. i hope it applies to the price here un méxico, usually 39.99USD games go for MX799.99 which is roughly USD56.99, so the eShop here in méxico is charging us 43% more for the same game. I'm not a big fan of downloading retail titles at any price but for a game you are supposed to play every day for the rest of your life it makes a lot of sense. Good to see this in the eShop 2 months in advance of it's mid June release. So who has $2.59 in their account? OMG is this a new price tag for upcoming releases? I love it but I don't get it! Animal Crossing is bound to sell millions no matter what price tag it's released! How much do you guys think DKC 3D will cost? I believe they can't charge full $39.99 for it, can they? Nice, I'll happily take any savings I can get. That said, I don't expect all of Nintendo's first party titles to be priced this way. I think they are picking and choosing certain titles to release at the lower price. Pokemon Mystery Dungeon also released at $34.99 (although the eShop charged more erroneously for a day or two) on the same day that Luigi's Mansion released for the full $39.99. @SheldonRandoms If you're referring to DLC, they've stated that AC will not have paid DLC. Granted that was a long time ago and there was a point at which we thought no first party games would, so who knows. This is definitely one I want as a digitally release. I'd probably happily pay more for a digital copy than a boxed copy, as I'll keep playing it much longer with it saved on the system than if I had to keep swapping the cartridge in for 10 minutes every day. With the 5$ I save, I can buy a 5 dollar footlong! Thanks, Nintendo! June 9th is going to be an AWESOME day! Amazon, Best Buy, and Gamestop are all selling it at that price. It's not an eshop discount. Can someone confirm what this will prob mean to us europeans? In a comparative sense if anything. I must buy this game! This is excellent news. 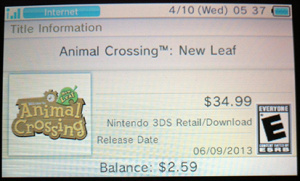 I always welcome a discount to a game as popular as Animal Crossing. Shocked but pleased that Nintendo would go cheap on a game that is sure to sell millions. This is tempting me to purchase this digitally. This would be a game that would very handy to have on my 3DS at all times. Like many here I was already going to buy it digitally, no matter the price. I really hope it goes for £30 or at most £35! That's the normal price on Amazon right now. Guess that's the MSRP right now? Nintendo must be generous. They could sell this game for $100 per copy and it would probably still sell like hotcakes. I really like this small discount. Even though it is little, every dollar counts for me x3. Three "e"s in "greedy" in the article. And it's only 1 GB. That's honestly less than what I had anticipated. I'm getting it through eShop for sure. Yeah, I prefer physical copies, but this is a game I'm gonna be playing every single day for a long time, so... yeah. Digital for me. I always wished AC had backwards compatibility. That's why pokemon sells to me more than AC in a sense of addictiveness. I only played the original AC, but for hundreds of hours in hopes of being able to send items or bells to future versions. Great! This will actually be my first Animal Crossing game! I was already planning on buying this digitally anyways so this is even better! @2Sang Animal Crossing City Folk did allow you to carry over your character's face and hair, along with part of their Nook catalog from Wild World. I don't know if this version will do anything similar. Personally I think it kind of takes away from the core gameplay to start with most everything unlocked so even given the option I opted to start fresh on ACCF. Go digital because you don't have to insert and remove a game card? Are you implying you are expected to EVER remove the AC game card? In all seriousness, my first and last AC was City Folk, but due to the convenience of a handheld I am feeling tempted to get this one. That small discount does not hurt either. @SMEXIZELDAMAN That's how folks from Emerald Island spell it when they mean extra greedy. And then they have a whole lot of Day 1 DLC. yeah but then it doesn't feel like an accomplishment after getting a rare gyroid or a golden tool. Maybe not make those things available until after you've paid off your house or something. $34.99 is the price on my grandson's pre-ordered copy from gamestoppo, which i did the last week of march. i am planning on downloading it for my 3ds xl. If all retail downloads were £34.99 I'd buy pretty much all of them. That extra £fiver that brings the cost up to £39.99 just seems like way too much to me! i do agree that 34.99 seems more reasonable, but i'll admit i was more excited about it when i was still under the impression that it was actually discounted for the eShop. ah well! I bet it's going to be $69AUD in our eShop like every single other big Nintendo game. There is zero sentiment to buy digital in Australia. I like it when big name games are sold at a lower price like this, it says good things about the company when they do this sort of thing. Granted its not exactly a large amount of money but every little bit helps. @3DSonicPizzaHD has the right idea. Almost makes up for that long long long wait Nintendo thank you very much. Still if it is the same at retail (from what I have seen it is) I will be picking this up physically which means I won't play another game on my 3DS...forever. I want to go digital download for Animal Crossing New Leaf, but I'm concerned about backwards compatibility and 3DS transfer. 1. How many times can I transfer a digital game, like if I upgrade to the 3DS XL? 2. Will digital 3DS games transfer to future versions of the Next DS/GameBoy? I convinced a friend to buy a 3DS based only on this game. We're gonna own it! I was not planning to buy it digital but when someone mentioned how much simpler it would be to just load it when I want to play like 10 minutes, a light went on in my head. What a great idea. Plus I have no attachment to owning a physical copy of AC like I would a title like Etrian Odyssey IV. Thanks NL commentors for mention a great idea that makes plenty of sense. @Meety-cheeky I don't know about 1 (although I'm guessing unlimited times) but given that Nintendo let you transfer downloadable games from the DSi to the 3DS and from the Wii to the Wii U, I would be willing to bet they would consider that a priority in 5 or 6 years. I don't think that is your biggest worry with downloadable games. Your biggest worry is losing your system or your memory and having to rebuy it, but the same could be said of a cartridge, so I wouldn't worry too much. Anyways, I'll be getting the downloadable version. I get downloadable versions when it is cheaper and/or when I know I'll want to play the game anytime and not want to sell it. I don't download adventure games like Luigi's Mansion 2 because sometimes I do want to sell them. Animal Crossing is not only one of my favorite franchises but a game I want to be able to play anywhere at anytime. Looks like it'll be a tad easier to buy two copies now. @DerpSandwich Didn't you read the other comments? It does cost the same at retail. Nintendo of Australia is likely to charge $69.95 for it as they do for all 1st party Nintendo titles. "Budget" 1st party titles retail for $49.95, but I don't think that Nintendo would be that generous for a franchise as popular as Animal Crossing. Why is everybody so excited about buying a new air conditioner for $35? Oh...Animal Crossing! I hope it's cheaper in the Aussie eShop as well. Being able to pay a mere $60 for it would be fantastic! Maybe you are not given a world to save, or tons of enemies to blast, but here's a pletora of things to do. This is a "love or hate it" game, some people love it, others find it pointless, easy as it is. About the price, I will pay far less then 35 dollars, or euros, for a retail copy, as usual, but still want this game to be installed on my 3DS, I don't know what to do by now. I already had $40 ready for my digital copy.. but $35? The $5 cut was unexpected and it makes me happy. Well, more money to blow on FE:A DLC (still waiting on the Future of Despair chapters.. ). With all the AC:NL news lately, the wait is killing me. @Dodger thanks for replying to my post earlier, I did some research and I found out that you can only transfer your 3DS games for a total of FIVE times. I decided that I will indeed go digital for AC:NL, but I wish Nintendo would just make an online account system already, we need a system like STEAM on PC. @sinalefa Not sure if you're talking to me specifically. squints like Fry Well, I'll explain myself. The fact is, Animal Crossing just seems like a natural fit always being in my 3DS. I confess, not switching carts is an admission to laziness. But I will play Animal Crossing every day, but sometimes I'll likely only play for a few minutes just to update my town. That way, it'll save me some time to swap carts. Yeah, it's... not a huge thing, but it's still convenient for moi. To always have this alternate life with me anywhere, never having to switch carts, appeals to me. But that's just me! Also, nice avatar. @AhabSpampurse It probably means we will get it for more than retail, still. Maybe it will only be £35 instead of £40. This discounted price has been on Gamestop and Amazon's website since the dawn of time. On Amazon.it you can already pre-order the boxed version for €39.58. I could bet 1€ that the price in Europe for the digital version will be the usual €44.90. I'm going to freaking scream at my 3DS as soon as I see the price tag on the European version. I bet it's gonna be €44.99 which is obviously ridiculous. Why! WHY! Can't wait to get this game for $34.99 + Tax! @Jukilum That's funny, I thought it was only $35 on Amazon. Well dang. No steps were taken this day. I do have to wonder what their motivation was for this decision. It's not like they're going to get more sales with a price point only five bucks lower, but then that's five bucks per copy they're losing out on. Strange. @FernandoMachado I don't see why not. It cost $50 on the Wii. It's also a fantastic game. I wish we could pre-order games on the eShop. I have $35 on the dot right now. If you buy games from eShop you don't pay tax. I bought Fire Emblem no tax.